Originally from Madras, our Senior Manager of our Global Digital Center came to the US for love. A born storyteller, now she’s helping Criteo tell stories through digital marketing and demand generation. This week, we sit down with Maha – as she’s known around these parts – and learn more about her career path and her favorite part of working here. I travelled all the way from Madras, a city in the South of India to Manhattan about five years ago. Before that, I worked for nearly 10 years in Media sales and Brand integrations. My last stint before moving to the US was at NBC Universal’s India Venture for CNBC TV18, the business news channel. I worked in Print/Radio/TV and Online Media sales in India with various brands like Times of India/CNBC etc. I came to the US with my husband on the dreaded H4 dependent Visa which meant I couldn’t work. So even though I had a MBA from India, I decided to go back to school. I got my MS in Digital Marketing and Analytics from NYU. Since graduation, I’ve been specializing in B2B Tech Marketing. I was a storyteller right from my childhood and that led me to specialize in marketing. Even though during my media stint I had an opportunity to work with various B2C and B2B brands, I found B2B brands more fascinating. At CNBC I worked with some of the biggest tech brands like IBM/Accenture/Dell/Wipro etc. and my job was to develop/pitch and execute 360-degree integrated campaigns for these brands. I loved it. After finishing grad school at NYU, I decided to specialize in Digital Marketing and Demand Generation. Initially, I worked for a life sciences SaaS Tech company called Medidata and helped them build their digital marketing stack. I love digital marketing and working for a martech company is all the more exciting because your product is also digital marketing. That is what got me interested in Criteo. This is like a dream come true for the marketer in me: I get to be a part of a company whose solutions help marketers achieve ROI across the shopper journey. What’s the goal of your position now? I am a part of the “Global Digital Center” at Criteo. Our team has four main pillars: the website, demand generation, digital marketing, and digital nurture. I work on Demand Generation and Digital Nurture. My goal is to generate demand for Criteo and nurture leads and make them sales-ready. Criteo has the best solutions when it comes to Commerce Marketing. The goal of our team is to act as a bridge between the marketers who are looking to find the best-in-class commerce marketing solutions and our sales team. What do you think of the Criteo culture? I am pretty new to Criteo, but I can already tell Criteo has a great culture. In the current digital marketing world, your audience wants everything at the touch of button and they expect the brands to be available immediately and that is the main motto of Criteo: “Think and Act Fast”. Moving fast enables us to be there for our audiences when they want us. I especially love our “Go Go Go” and “No Fear” mindsets. Criteo recognizes that there are going to be failures along the journey. So to be fearless in our decisions and move fast so that even if we fail, we can learn, pivot and keep moving. Criteo’s secret sauce is our people. I have met some really smart, enterprising and knowledgeable coworkers here. They are also extremely warm and welcoming. From day one, I felt at home at Criteo. We also have some great perks! How opportunities have you had at Criteo so far? 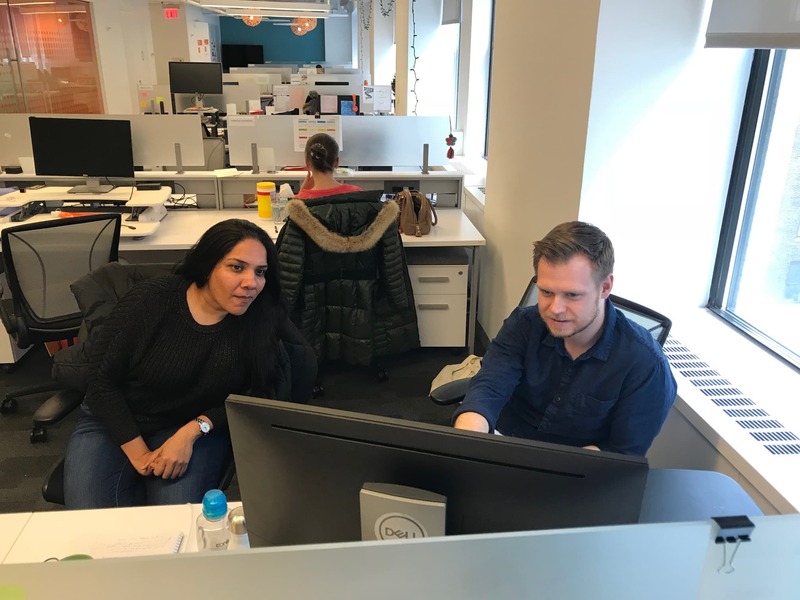 Maha discusses digital with Justin Kloc, our Digital Marketing Manager. For me, the best part about working here is my amazing team. Every member of the Digital Team is so knowledgeable. I learn something new everyday. Another great advantage is that this company is any digital marketer’s dream. I get to see the best commerce marketing solutions in action and also market them. I think Tech Marketing is my calling. I see myself continuing here and learning more. Eventually I would like to move to one of the emerging markets in APAC, because I see a lot of opportunities there in Digital Marketing. Being trilingual, I get to read books in three languages and that is pretty exciting. I am also a huge movie buff. I watch a lot of world cinema – Persian/ Spanish. As long there are subtitles, I can watch any movie. Any advice for people interested in digital marketing? My biggest advice to any newcomer is to be “Hungry to learn”. Want to learn more about Criteo? Check out Criteo Culture!